There are those who say if you want to know the secret to making a great bagel, you have to learn at the foot of a master — you know, one of the three or four remaining old-timers, who practice their dark arts deep in the recesses of Montreal and Brooklyn. Others cite that old urban legend about New York City tap water, without which Bay Area bagel makers might as well be attempting alchemy. But according to Dan Graf, there’s nothing magical about the process — just hard work and some good old-fashioned science. The 27-year-old self-taught baker’s new one-man operation, Baron Baking, is the latest bagel purveyor to make waves in the East Bay — Baron Baking is now the sole bagel supplier for both Saul’s Restaurant & Delicatessen and Chop Bar, and his bagels will also be available at the new Uptown sandwich shop, Stag’s Lunchette, when it opens next week. Oh, and Graf’s bagels are pretty delicious. The story of Baron Baking started a few years ago, when Graf was an employee at Saul’s, where he was the deli manager for a while and then worked as a line cook. Graf, a New Jersey native, said that he and a few other East Coast transplants who were working there at the time always used to bemoan the state of the Bay Area bagel scene. “Noah’s was pretty much the only game in town,” he recalled. Peter Levitt, the restaurant’s chef and co-owner, used to say that one of them ought to do a “stage” at a New York bagel place and then come back and make bagels for Saul’s. But Graf said after he’d left the restaurant and decided he wanted to figure how to make the perfect bagel, he didn’t think such a pilgrimage was necessary. Instead, he found all the information he needed online; the rest was months of experimentation. Graf explained that he was especially inspired by Modernist Cuisine, the mammoth six-volume cookbook that rocked the culinary world when it came out last spring — not so much for the techniques of so-called molecular gastronomy, which the book is most famous for documenting, but simply for the scientific approach to cooking that it advocates. “You make a list of the characteristics you want, and then you go about figuring out how to make those characteristics a reality,” he explained. For Graf, who studied civil engineering and genetics in college, that kind of scientific approach to problem-solving really resonated with him. He knew what kind of bagel he wanted to make, and it wasn’t strictly a “traditional” New York bagel — for that, Graf says that Schmendricks, the San Francisco-based pop-up, is about as close as you can get in the Bay Area. Graf explained that he started out just baking to his own palate, and what he wanted was a bagel that was crunchier and a little bit richer than a typical East Coast bagel. And after about a year’s worth of experimentation, and about thirty or forty different variations on his recipe, he finally came up with a product he was happy with. 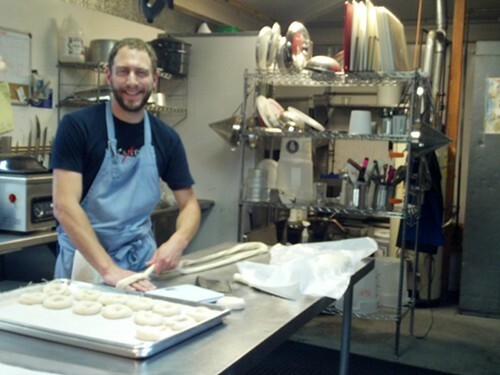 Dan Graf rolling out a fresh batch of bagels. Without giving away too many of his secrets, Graf told me he figured out a few techniques that were key: The first is a very long (48-hour) two-stage fermentation process: fermentation that’s followed by a retardation stage (a second, slower rise that’s done in the refrigerator), during which the dough develops its rich flavor. Graf explained that this so-called “double-stage fermentation” is a traditional method that’s being taken up again now by many of the trendy artisan bread makers. The other distinctive technique that Graf uses is the addition of lye to the poaching water in which he boils the bagels. Graf explains that even a very small amount of lye — at a concentration that’s entirely safe to handle — dramatically increases the pH level of the water, resulting in a crispier, browner crust. Recently, I had a chance to try a couple of the Baron Baking bagels, and they were excellent: deeply flavorful, with a shiny, well-blistered crust. Even more than with any other bagel I’ve had recently, I really noticed that the crust had a nice snap to it — that the “skin” had a distinctly separate texture from the dense, chewy interior bread. As a frame of reference, Graf says his bagels are a little bit crunchier and have a little bit less malt compared to the ones at Schmendricks. To be fair, I’ll have to try a few more of each respective bagelry’s product, back to back, to decide which one I like better. 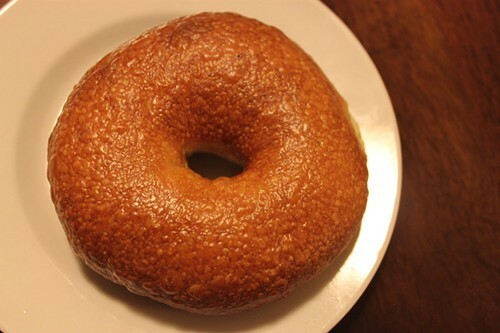 A plain Baron Baking bagel. Graf told me that he’s still fine-tuning his recipe, but that his bagels have already been quite well received. They made their public debut a few months ago at a community gathering hosted by Stag’s Lunchette owner Alexeis Filipello, who raved about the bagels and invited Graf to share her commissary kitchen space so he could continue developing his product. Baron Baking landed its first big account (Saul’s) in early June, and Graf has slowly expanded his production ever since. As a one-man operation, he says he’ll max out at about 250 bagels a day. Once he reaches that point — probably not long from now — he’ll have to hire another baker to help him. Another great thing about the Baron Baking bagels is that, as far as artisanal bread products go, these are a relative bargain: Saul’s, for instance, sells them for $1.25 each. Given the recent rise of so many new Bay Area bagel makers — Schmendricks, Beauty’s Bagel Shop, Authentic Bagel Company, and now Baron Baking — I asked Graf if he was worried that the local market might reach a saturation point. Graf said he wasn’t. He likened the current bagel situation to when The Acme Bread Company started out in the 1980s, supplying bread mostly just for Chez Panisse. But slowly, as customers realized what good bread was all about, they started to demand that same level of quality at other restaurants as well. So the market expanded.